After you’ve created buttons and gotten a taste of adding ActionScript to the timeline, you put it all together in Adobe Flash CS6 by “wiring up” a photo viewer on the main timeline with ActionScript. The Code Snippets panel does most of the heavy lifting here, but your understanding of the Actions panel and modifying statements will prove quite handy. Import five unique photos or graphics to your Library. Create a button symbol that can represent both Forward and Backward buttons. For instance, create a right-pointing arrow that can be flipped over. On the main Timeline, create a new layer and add four keyframes back to back (totaling five); on each of those keyframes, place a unique image or graphic from your Library so that you have five images on consecutive keyframes. Create a new layer and add two button instances to it. One button should represent a Previous button on the left side of the stage; the other one, a Next button on the right side of the stage. 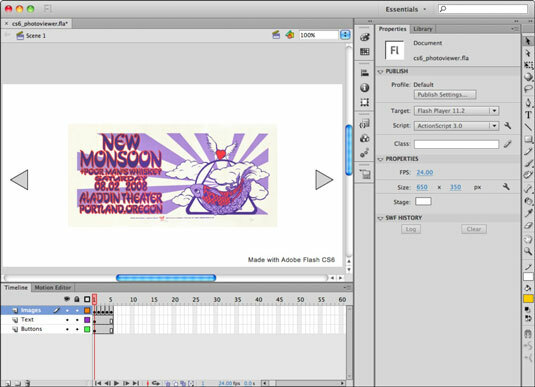 Create a new layer and use the Text tool to create a piece of type that reads “Made with Adobe Flash CS6” on the stage. Place it in the lower-right corner of the stage. Your photo viewer should look similar to this one.